Multi-woodwind maestro, Arlen Asher is one of New Mexico’s long-standing jazz luminaries. Prior to becoming a full time professional musician, Arlen worked as an award-winning producer and announcer for KNME-TV, KOB-TV, and KHFM radio. 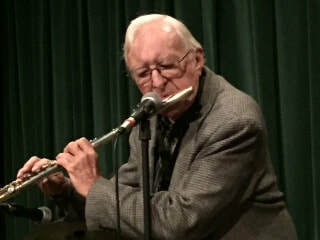 He left broadcasting to establish a private woodwind studio in 1965 and since then has been teaching woodwind fundamentals and jazz improvisation to hundreds of students throughout the US. In the 1970s, he formed the Arlen Asher-Bob Brown Quartet, which formed the basis of two jazz television series for KNME-TV and a series of concerts that included guest artists such as trumpeter Clark Terry. Arlen has appeared on numerous CDs including his own 2002 release, “Another Spring”, featuring a virtual Who’s Who of New Mexico jazz talent. Arlen also performs on Straight Up’s top selling CD entitled “Live in the Desert”. Straight Up has appeared at many jazz festivals, including the Tucson and Sedona Jazz Festivals and Jazz in the Sangres in Colorado. Arlen is the recipient of the coveted Mayor's Award for Excellence in the Arts 2008 - an extremely well deserved award! Arlen and John Trentacosta co-host a weekly jazz program heard on Santa Fe's public radio station.